Formerly Lady Gielban's chambers, she abandoned it in favor of the Royal Suite after her father's passing. A guard leads Tameo in to this suite. "Thank you, my fine fellow," he says to the guard. The guard leaves. It worked! At the very least, I've secured myself extravagant lodging. And that's not including my pay. I wonder, though, if there's a way to make this situation even more profitable. That drug I gave the Queen is addictive, as well as long-lasting. I am well versed in some mild black magic. Perhaps if once a day I were to make her feel dreadful, until I put one of my "spells" (or rather the drug Quellz) on her. It's brilliant. In the morning, I shall try it. Essence and Tameo walk in. Tameo takes a seat at his desk. He sits in silence, staring out the window. After Essence had tended to the queen, she had gone to follow after the one she was told to work with. She stared around the room in awe. It was ornate and gorgeous, and she felt like an intruder. "Are... you sure we are allowed in here? 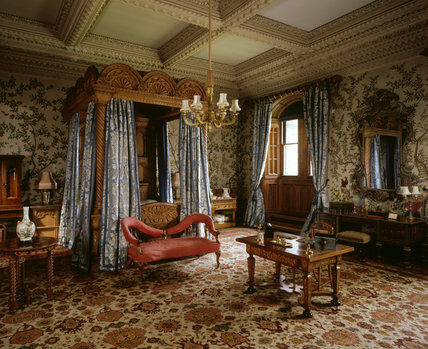 It seems more like a dignitary's room..." She asked as she stepped inside, closing the door behind her. She sighed a little. "So what is this situation and threat?" "To put it simply, the Queen is the target of a malignant spirit. I am trying to place a barrier between her and the spirit realm"
Essense stared at him a little in confusion. "I didn't see a dark spirit like that, or sense one. And as far as I am aware, the Veil hasn't broken..." she responded, watching him curiously. "This spirit is evasive. There are many things it can remove from view. I have tried to administer treatment, and to isolate her from harm; bit that overprotective guard of hers doesn't cease to complicate things. He always is able to manipulate the Queen in some way. Hey, I just had a thought. What if this spirit were possessing the guard, so as to convince the Queen not to take treatment? Do you think that possible?" Essense just looked at him, almost blankly. "What kind of treatment are you trying to give her? And how would isolation keep someone safe from a non-coporeal entity that can just follow them? That sounds dangerous." "Not physical isolation. Mental isolation. Itrakes this spirit down to a man named Emeric. I advised the Queen to keep away from anyone and anything that reminded her of him. With council from her guard, she insisted this was not possible. However, I am convinced it is the only way to protect her."